In an era of environmental change linked to global warming, floods are frequently in the news, whether they are those which affected England in the summer of 2007 or the ones which have devastated other parts of the globe, from New Orleans to Bangladesh. There is growing interest in the severity and chronology of flooding in the past as an indication of possible future scenarios. In Britain regular scientific measurements of streamflow and flood peaks often go back for only 30 years or so. However, historical records can provide details of past floods reaching back to the seventeenth century and sometimes earlier and yet they have rarely been examined in detail. 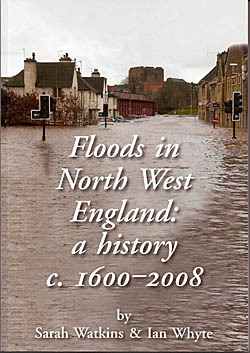 Floods in North West England: a history c. 1600 - 2008 is the first detailed study of flooding in the region and is essential reading for anyone who is interested in the impact of climate change on Britain. It explains why floods happened and what effects they had on the landscape, the buildings, and the people who were affected by them. In the course of this volume the authors tell some dramatic stories, many of which have lain forgotten among the pages of old newspapers and other records.